When it comes to being a woodworker, no matter your experience level, most people picture themselves making furniture pieces or gifts for loved ones. The more we did it, however, the more we realized that we can actually use our skills for ourselves too, to benefit the very hobby we’re talking about! The beauty of being able to make things yourself is that you can also make things that make your workspace an even better place for you to use. That’s why, when we realized we were in need of a new router table, we decided to seek the Internet’s helping in making one ourselves rather than buying one from a store. 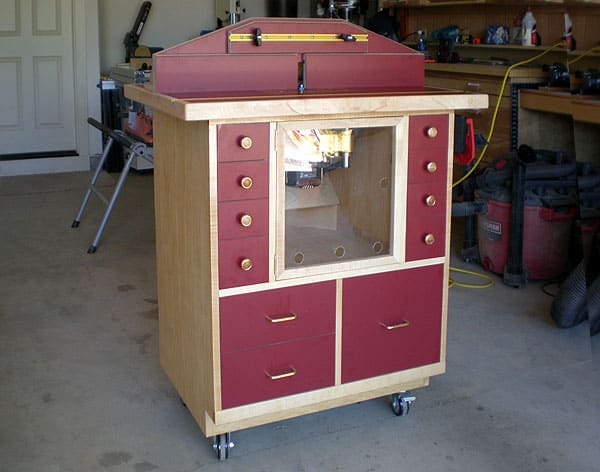 Just in case you love the idea of making your very own router table from scratch just as much as we did, if not more, here are 15 of the very best designs, structures, and tutorials that we came across in our search for info and guidance! Even though you feel fully prepared to make a router table of your own, are you still a little bit closer to the beginner’s side of the spectrum in the grand scheme of how experienced woodworkers go? 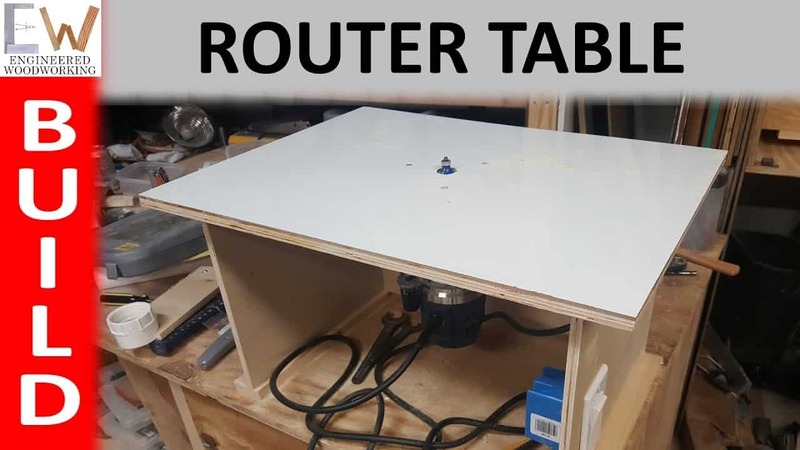 In that case, we’d definitely suggest taking a look at how Instructables made this simple, effective router table in just six step, which they’ve outlined for you carefully and clearly. 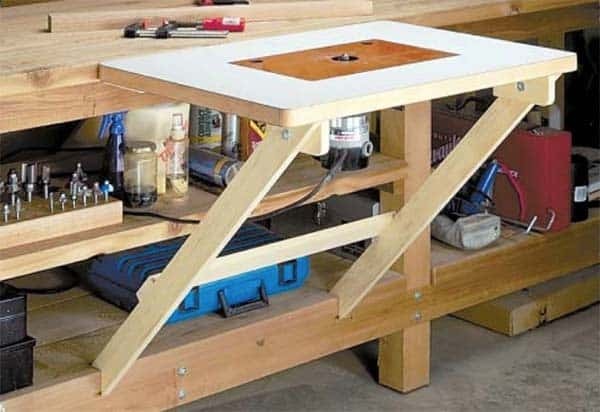 Perhaps you actually already have quite a large workbench in your space and, besides the spot where it’s sitting, you don’t really have a lot of room for a completely separate table like the designs you’ve seen so far? 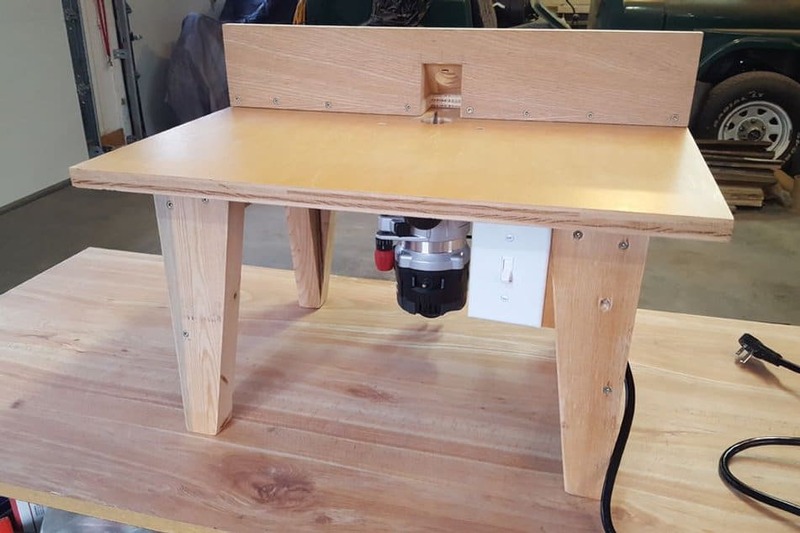 In that case, we think perhaps you’ll get along a little better with something like this bench top router table from Mitch Deitrich instead! They show you how to make one that sits on top of your regular workbench rather than taking up space of its own. 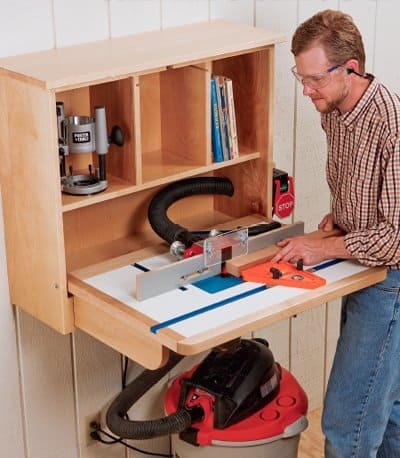 Are you actually really into the idea of a bench top router table but you’re a little more inexperienced and on a little more of a budget than what you saw above allows for? In that case, we think you’ll really enjoy the way Engineered Woodworking and DIY gives you instructions for making a more simply styled router table that only costs $20 to build! 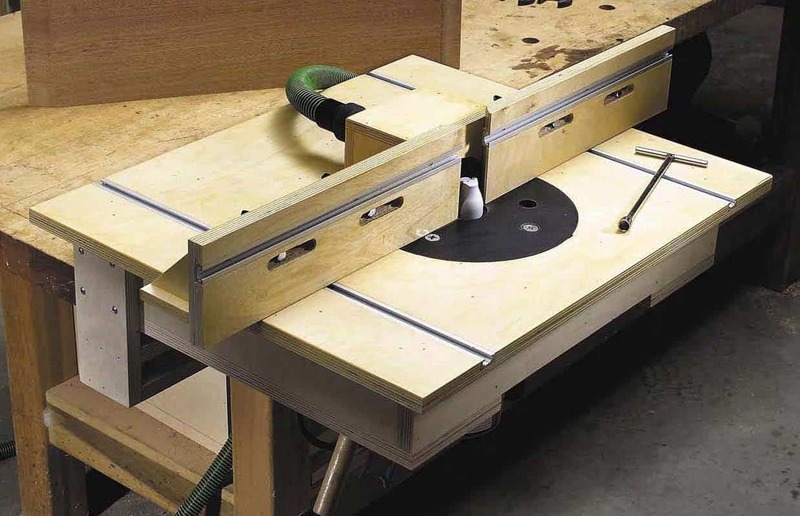 Are you kind of intrigued by the idea of a bench top router table but you’re not fully convinced because you can’t decide if its best for your space? Well, luckily for all of us, that’s not actually the only kind of router addition you can make for your workbench! Also consider this two-day plan outlined by Popular Woodworking that shows you how to build one like an extension on the end of the table you already have. 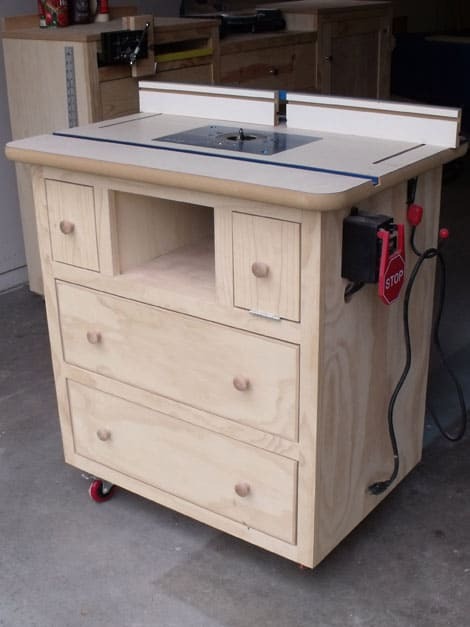 Just in case you are interested in building an entirely independent router table but you’d like to make the most of it if you’re going to add another structure to your space, here’s a fantastic piece by Creston Wood that not only moves around easily thanks to the way it has wheels instead of feet, but that also features plenty of storage drawers for all your different tools and supplies! Did we really catch your attention when we started talking about router tables that were friendly for beginners because that’s definitely how you’d still classify yourself but you’re just not convinced that the simpler ideas we showed you earlier are quite simple enough? Then we’d suggest taking a look at this tutorial from Woodsmith instead! It’s built in an easy box structure and is specifically designed to cater to the skills of beginners! 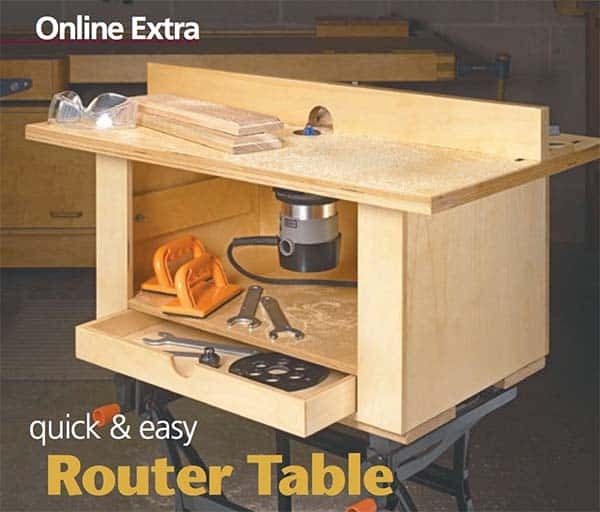 Perhaps you already have a router table and you’re looking to take it to the next level or add a few extra features so you can really get the most out of it? 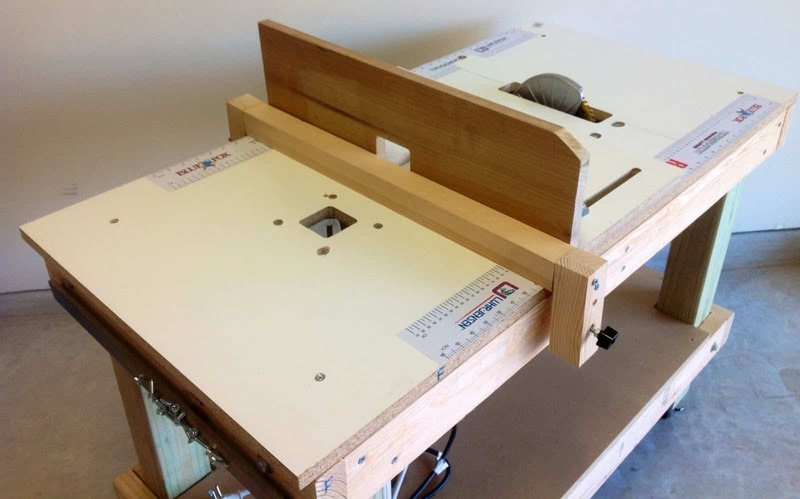 Then we’d definitely suggest taking a look at how Microjig made this fantastic router table pressure jig in just a few surprisingly simple steps. This jog applies the right amount of pressure neat the edges of your wood in order to let you make more precise cuts in a safer way. Are you actually feeling confident enough in your woodworking skills right now that you’re convinced you can handle making a router table that’s a little more stylish and visually pleasing, rather than just being cut together in a more raw sort of way? In that case, we’d definitely suggest taking a look at how this lovely, very near looking table was created step by step by Ana White. Maybe simple and cut together in quite a basic way is precisely what you need? Whether it’s a skill thing or a love for minimalist aesthetics, we think you’ll get along quite well indeed with this fantastic piece outlined in clear, straight forward instructions on Woodsmith Shop. They even show you how to make a slightly more complicated cupboard and shelf version should you decide you’re up for the challenge. 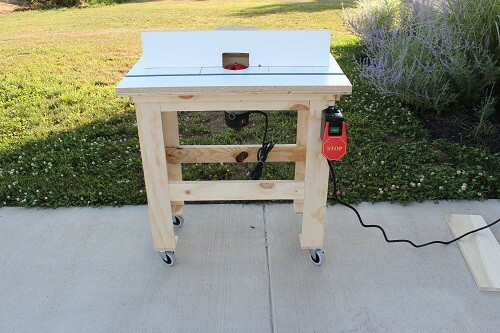 We’ve actually shown you one or two other router table tutorials that taught you how to make a table on wheels, but they were quite chunkier and larger in their design, so they were unlikely to be pieces you’d move around at whim if you didn’t absolutely have to. We understand, however, that sometimes it’s nice to have your pieces be quite mobile, particularly if woodworking is your job and you freelance, or if you’re doing home renovations! That’s why we liked this smaller, more mobile wheeled router table design from One Project Closer so much. 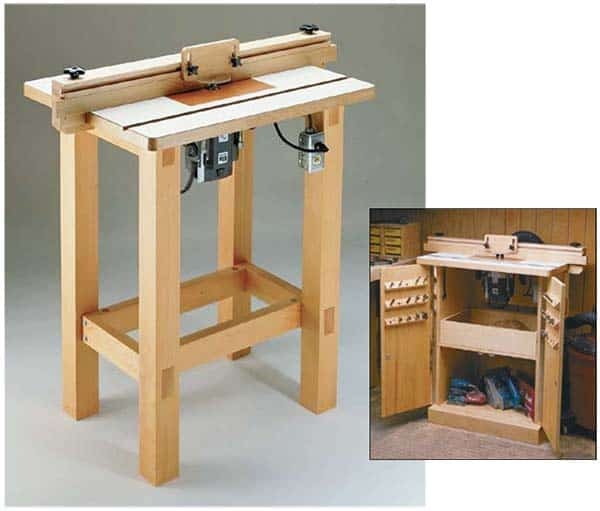 If you’re going to put in all the time and effort it takes to make a router table of your very own, would you rather actually create a multi-purpose piece that helps you diversify your limited space in a neat way as well? In that case, Thinking Wood has the absolute perfect piece for you! Check out how they made this structure that has a router table, a workbench space, and a spot for a table saw all built into one. Perhaps you’re very much in need of a router table but you’re actually a little bit limited in terms of both floor and workbench space, so you’re looking for a design that’s a little more unique? Well, if you’ve got wall space to work with then we think we might have found just the idea for you! 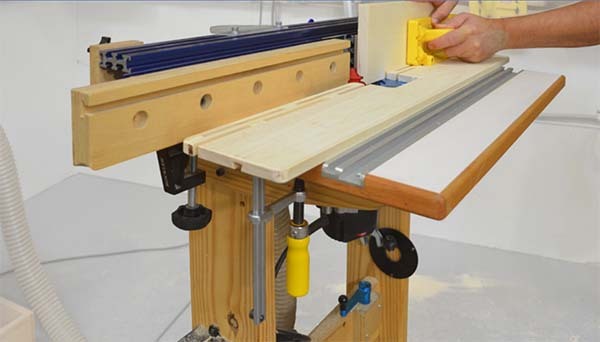 Check out how Rockler built themselves a wall mounted, fold-down router table that works just as well as any of the others you’ve seen here so far. Are you actually not entirely sure that any of the router table options we’ve shown you so far will actually fit in or work for your space because it’s very limited indeed, but you’ve got projects in the works that you know you’ll definitely need one on hand for? Then perhaps you’d prefer to build yours as the smallest extension possible? We love the way Jeff Branch shows you how to make and attach custom pieces that will turn your regular saw table into a router table with a bit of time and effort. 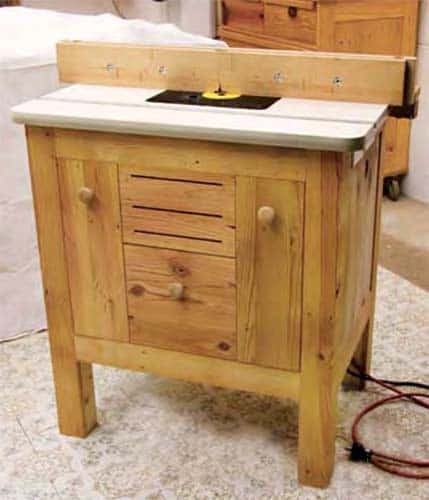 If you’re going to put in all the time and effort that making a router table of your very own takes, would you actually also prefer to take that as an upcycling opportunity? 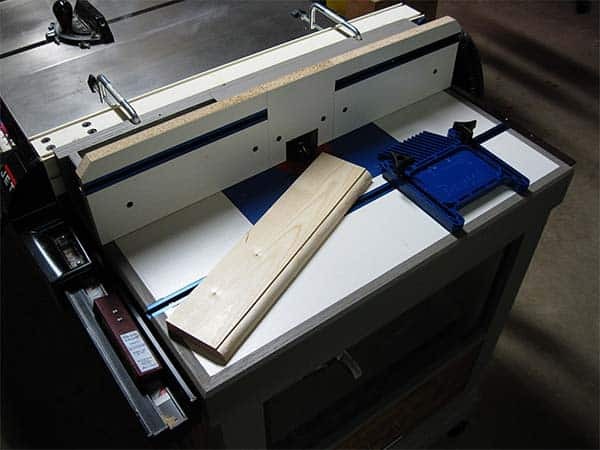 In that case, we have a feeling you’ll get along very well indeed with something like this tutorial from Popular Woodworking that shows you how to make a router table from an old wooden cabinet that’s already built! Sometimes it’s nice to save time and repurpose things by customizing rather than starting from scratch. 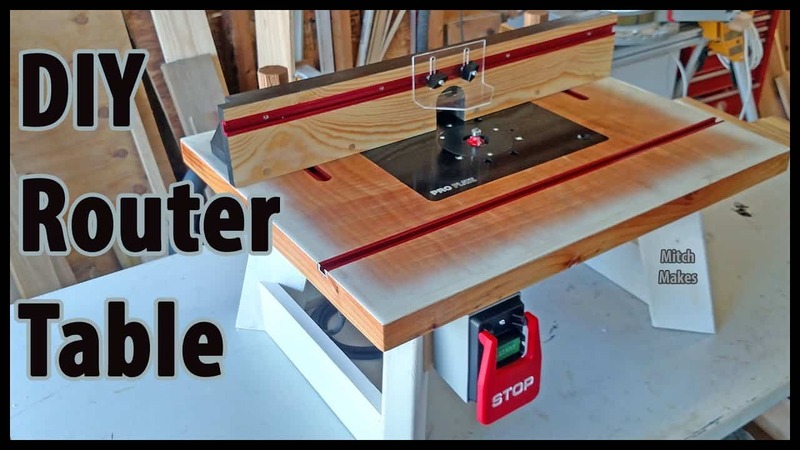 Did we actually grab your attention quite well when we started talking about the fold-down router table we showed you a little earlier on our list but you don’t actually have the free wall space to make the mounted box version that tutorial outlined? Well, what if we told you that you could build something similar that attaches right to the edge of your workbench in a similar folding manner instead? Get the full details for making your own on Woodsmith! Do you know a fellow DIY enthusiast and amateur carpenter who has been thinking about making their very own router table for a while now but who feels like they could use a bit of inspiration or guidance along the way? Share this post with them so they have all kinds of ideas and resources to work with! The post DIY Router Tables From Scratch appeared first on DIYs.com.